Abnormally enlarged cattle organs, such as thyroids, ovaries, hearts, and livers, despite an overall loss in body fat. Lower birth rates as well as reproductive abnormalities. The repeated use of illegal antibiotics and other drugs for treatment of bacterial infections. Despite these reports, the use of rBGH and its consumption did not slow and continued to invade our milk supply as well as our bodies for over a decade. Studies have shown that cows injected with rBGH have higher concentrations of Insulin Growth Factor 1, or IGF-1, which is in smaller quantities naturally produced by bovine and human breast milk. IGF-1 is directly responsible for the increase of milk production when stimulated by injection of rBGH, as well as cell growth in both bovine and human offspring. The presence of IGF-1 in breast milk is biologically necessary for infant growth and development, but on the contrary is of no value to a fully developed adult. Due to higher promotion of cell division and growth, elevated concentrations of IGF-1 have been found to be extremely cancerous, specifically associated with colon, breast, ovary, and prostate cancers amongst studied men and women. Monsanto and FDA made statements regarding the impossibility of transferring IGF-1 through milk consumption claiming pasteurization of milk eliminates traces of IGF-1, bacteria, and antibiotics. The FDA and Monsanto were both deceiving, as studies have shown that IGF-1 is highly resistant to pasteurization, where in some cases the process increased its potency. The human digestive system is not able to digest or destroy IGF-1, and therefore it is absorbed by the colon which is a biological IGF-1 cell receptor. In 2003, a quiet storm brewed overseas as Monsanto’s several POSILAC plants in Austria were found to be the sources of bacterial outbreaks stemming from unapproved amino acid sequencing used in producing rBGH. By 2004 severe antibiotic resistant bacterial Staphylococcus infections were infecting Austrian hospitals, followed by an outbreak of relentless acne known as Propionibacterium acnes. Monsanto ceased production of POSILAC in Austria in early 2008 and instead began manufacturing in the United States. Public pressures as well as lack of demand have dramatically declined the sales of rBGH milk all over the country. Profits from POSILAC took a downward spiral, and in late 2008 Monsanto sold the patent and manufacturing rights to pharmaceutical giant Eli Lilly and Co. for $300 million under the agreement of Monsanto receiving portions of future profits. The use of genetically altered hormones for food production has been banned by the European Union, Canada, Australia, Japan, and New Zealand prior to the year 2000, yet it remains completely legal within the United States a decade later. 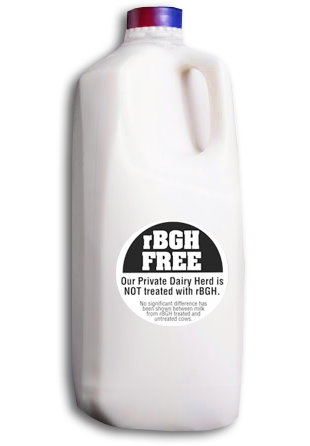 Educated consumers, as well as retailers and dairy manufacturers have been fighting the war against rBGH by opting to produce, sell, and buy “rBGH-free” labeled products. In a desperate attempt to remove informed decisions of consumers, Monsanto filed several lawsuits against companies which actively promoted “rBGH-free” labels on their products, claiming such labels caused an unfair representation of their product, suggesting there is something wrong with dairy produced from injected cows. According to Monsanto, because POSILAC is FDA approved, its dairy is therefore of equal safety and quality of non rBGH treated cattle. Monsanto did not win their cases and “rBGH-free” labels remain proudly displayed on appropriate products. ← Reviews! Best Online COUPON websites! I actually wanted to develop a remark to be able to express gratitude to you for these awesome points you are writing on this site. My considerable internet look up has finally been paid with brilliant information to write about with my company. I would express that many of us website visitors are definitely lucky to be in a useful place with many special individuals with beneficial secrets. I feel rather happy to have come across the webpage and look forward to plenty of more exciting moments reading here. Thanks again for all the details. My site is about Depression symptoms. I could not think you are more right!! !